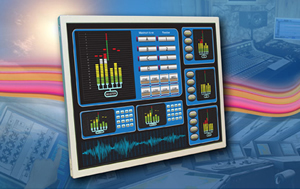 KOE Europe has announced the introduction of a new 12.1" TFT display module. The TX31D37VM0CAA features SVGA (800 x 600 pixels) resolution and IPS (in-plane-switching) TFT technology which provides exceptional optical performance and a wide 170° viewing angle. The new TX31D37VM0CAA implements in-plane-switching technology and a contrast ratio of 1000:1 which ensures that display images are concisely and accurately displayed. A white LED backlight provides a brightness of 600cd/m² and a 70K hour half brightness lifetime. Mark Stephenson, Technical Manager, KOE Europe, commented, "KOE now offers a range of medium size TFT display modules featuring IPS and LVDS (low-voltage differential signal) data interfaces." He continued, "Utilising IPS technology, the TX31D37VM0CAA provides a highly stable colour image from any viewing angle. The display module offers excellent colour saturation and exceptional black levels combined with a high contrast ratio." The single channel 20-pin LVDS data interface simplifies system integration and supports 8-bit RGB providing a colour palette of up to 16.7million colours. LVDS allows remote, high speed digital transmission of the image data with low power consumption, excellent tolerance to transmission line effects and exceptional noise immunity ensures a precise display image is presented at all times. The display module features dimensions of 280mm (w) x 210mm (h) x 12.58mm (d) and an operating temperature range -20°C to +70°C.